Mr. Freston was interviewed by Randall Rothenberg, editor-in-chief of the quarterly business magazine Strategy+Business and editor-at-large at Advertising Age. 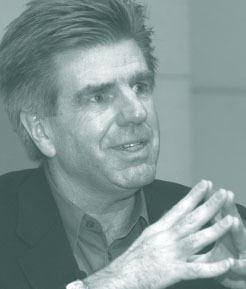 Tom Freston, co-president and co-chief operating officer of Viacom, received his MBA from NYU Stern in 1969. He has been with the pioneering music channel MTV since its founding in 1981 and served as CEO of MTV from 1987 until last spring. MTV Networks, a division of Viacom, operates cable networks MTV, VH1, Nickelodeon, Country Music Television, Spike TV, Comedy Central and TV Land. The company also controls MTV films in association with Paramount Pictures and licenses consumer products. MTV currently broadcasts to 314 million of the world’s households in 136 countries and territories. MTV has branched out from its original fare of music videos to offer original programming, such as Real World and Newlyweds, and has engaged young audiences with its “Rock the Vote” and “Choose or Lose” campaigns. In June 2004, Freston was promoted to co-president and co-chief operating officer of Viacom, and is now responsible for the company’s cable, publishing and theme park units. RR: What television moments influenced you growing up in Connecticut? TF: I grew up in the '50s and '60s, which must seem like ancient history now, and I saw those iconic moments: Elvis's first time on TV and the Beatles and the Kennedy assassination. But I spent more time listening to the radio, and I was really touched by the Beat movement of the late '50s, early '60s, and the rise of the counterculture. I wasn't a hippie, but I was right here in Washington Square Park. And the late '60s was a real interesting time to be going to business school in New York City. There are certain themes from those movements that resonated with me. One was the notion that you should experience as many different things as you can, that travel would be a very important journey to take in your life. RR: So what motivated you to go to business school in the first place? TF: I couldn't really see myself being a doctor or a lawyer or a dentist. If I went to business school I thought I could find something that I liked, although it was really hard for me to figure out what that would be. It was also helpful at the time to get a deferment and stay out of the war in Vietnam. But I was very pleased to get into NYU. I was lucky enough to have Peter Drucker as one of my professors. anything that he specifically taught you? TF: I always remember him talking about innovation. Invention is creating something totally new. But the real thing in life is innovation, which is taking two things that already exist and putting them together in a new way. That's where most businesses come from. RR: What did you do when you left here? TF: I took off a year and a half and sort of bummed around. I was a bartender in Aspen. Then I went to Mexico and worked around the Caribbean. Then I decided I better get a job. I wanted to do something really creative. So I got a job at an ad agency, Benton & Bowles. They put me on a Proctor & Gamble business. I was assigned to the Charmin toilet paper account. But I was very alienated at the time. So after a year and a half I quit, and I spent a year traveling around the world. I ended up in Asia, and I was just so enthralled with everything I saw there. So I made up my mind that I would like to live there and work, and figured out a way to support myself. I came back to the States and found a friend who had some money. And in 1973, with the advent of air freight, it was possible to make something in a country like India or Afghanistan, and sell it 24 hours later in New York City. We set up factories to design and make clothes in India and Afghanistan. I had a house in each place. We sold our clothes through a network of showrooms here and in Europe and Australia. We did that for seven or eight years. It was an excuse for me to live an adventurous life in Asia. RR: Why didn't you stay there? TF: Well, the U.S. put in place a system of quotas on textiles and garments. Then the Russians invaded Afghanistan. And I had this epiphany one day. I was on a motorcycle in New Delhi. It was 110 degrees, and some gas from a diesel bus was blowing in my face, and I said, “I'm out of here.” We had made and then lost a lot of money, so I came back to New York with my tail between my legs. RR: So you get to Warner Amex Satellite Entertainment in 1980. That’s a pivotal year for cable. USA Networks started, CNN debuts, Showtime and The Movie Channel merge. What did you think this industry was going to be? TF: I was really lucky to get in when I did. There was a vision of an alternative television universe other than the three broadcasters – based on cable rolling out across the country and the idea of narrowcasting. Almost all the incumbents said it would not work – the ad agencies, the broadcasting companies, producers. You had this melting pot of people, none of whom had any experience doing it. I was on the development team of MTV and we all had a passion for music and the belief that a network like this would work. We emerged at what became MTV Networks as a real brand-oriented powerhouse. RR: You went from new recruit, to a company that didn't exist, to CEO in about seven years. What were the touchstones along the way that led you to the point of leading this company? TF: One of the good things about being in a new company in an industry that didn't exist is that no one knew what they were doing. The people ahead of you often got fired because they usually did a few things wrong. So it was easy to rise, if you had your head up, if you were able to learn. In those days, you'd go from a secretary to vice president in six months. I was the marketing guy at MTV. Every time someone would get fired, they'd give me his job too. So then they put me in charge of affiliate sales, and I had never had a sales job in my life. But we did well, and then they moved me after a year of that to general manager of MTV. Then VH1 came along. And at this point, I’m only at the company four years. Then we were sold to Viacom and a lot of people left. They made me co-president, for no good reason. Then the guys who bought us got blown out in a takeover battle with Sumner Redstone, and he came in and they made me the CEO. That was in 1987 and I've just been there since. I have a distinct lack of ambition. When you have a good job, just keep it. RR: Reflecting back on the almost 17 years now of being in charge of MTV, is there a difference between running a company and leading a company? TF: If you were in a mature business, like you make the reflectors that go on stop signs, you could run the company, make it work more efficiently, and get everyone to do a slightly better job. If you're in a world that changes a lot like the media, the organization really has to mutate and move quickly, and it requires strong leadership. That doesn't just mean leadership from me, but a model where there is good leadership coming from a whole bunch of places. RR: How do you do that? TF: There are five people who report to me, and there are maybe 15 people or so that report to them. And we talk a lot. I really believe we're a bottom-up company. You periodically will do a strategic plan that looks at how this world has changed, and to focus on, say, the Internet or on international or on digital services. RR: Can you give an example of an idea that bubbled up from below? Is Spike TV an example of that? TF: When Viacom merged with CBS, they had two channels: TNN and CMT. TNN was the Nashville Network and the average age of those viewers was 66. They wanted to make it a general entertainment network like USA Network. That's not what we do. So we decided, look, there’s Lifetime and Oxygen for women. It's understandable to advertisers and cable operators. And there is no channel for men. We thought maybe we could make this a channel for men that would include everything from men's health and finance to documentaries on sports figures. It's off to a good start. RR: Would you call that primarily a research-based process? TF: It was based on research and then looking at product availability. But at the end of the day it's about gut. There were one or two people standing up, pounding the table, saying this is a fabulous idea. You need people working for you who are passionate about the audience and have great instincts. RR: Where do you find those kinds of people and how do you nurture them so they stay around and don't move off and start their own companies? TF: There is a sort of self-selecting process. You either find someone who is very obvious, who is banging down your door. Or sometimes you just find somebody you take a chance on and you nurture them; you allow them a certain amount of freedom. We have 94 channels we run around the world, so it's very decentralized. Each is run by somebody who has a team under them, and they make most of their decisions. RR: I think a lot of people here are interested in how you manage a global company. What's the trick of globalization in a cultural industry? TF: Coca-Cola can basically make the same bottle of soda and sell it everywhere. But in the entertainment world you really can't do that because most culture is local. When we went into Europe in 1987 we had a pan-regional signal. We didn't have the amount of homes to develop the scale to have specialized services in each country. The VJs were people who spoke English as a second language. That worked pretty well for a while because it was a novelty. But the local competitors really said we had to change our model. So we decided to regionalize and now we have 45 different feeds of MTV around the world. RR: Do you have programming and leadership flowing between or among these units? Do you find great executives in France? TF: Every general manager can pick and choose for MTV or Nickelodeon or VH1 whatever they want on the worldwide feed. In doing so, they get to know each other. On the management side, outside the United States, there is a great interchange of people moving from region to region. I've been disappointed continually in the States by the number of people who are here who don't have any interest to leave. I always think, God, I'd be banging on the door. Send me to Singapore or somewhere. What I do find is you're probably better off having locals run your business than bringing in some expatriates, except in the early days when you want to do what I call the DNA transfer. Q: I’m a part-time MBA student and a full-time employee of your sister network, Showtime Networks. When we look at the consolidation in both programming and distribution, what advice would you give to your 26-or 30-year-old MBA student who would like to start their own MTV one day? TF: Most of the good ideas are taken for television networks where the economics are such that you could actually make money from advertisers and distribution. If you have great ideas for a real niche, there are a lot of great online applications where you have more control over your destiny and you can get started with a lower base of capital. Q: I am employed at MTV Networks and have been there for five years now and am a part-time student. I’m curious to hear your thoughts on some of the threats that we currently face with the emergence of digital cable? TF: On digital cable, we're trying to be at the forefront. I look to the U.K., which is the testing ground. There are 28 music channels in the U.K., if you can imagine that, and we have about 11 of them. What we've done is basically do brand extensions or bring in new brands. And they capture about 65 percent of the viewership and the lion's share of the money. Despite all this competition, we’ve been able to increase our market share, increase our overall ratings, and increase our business. That's a strategy we're set to put in place in a bunch of other countries. Having a strong brand in a world of endless choices becomes even more valuable. Q: How about another technology trend: music downloading and Napster? TF: We believe that that business is about to rationalize and become a viable pay business. The turning point was with iPod. We didn't want to be the first one in there because for the last several years there have been so many failed technologies. I didn't want to attach our brands to one of them early. In the next few months, we are probably going to announce a music subscription/downloading service. Q: It seems the record industry is not really signing and willing to promote new artists. Where do you see the music industry and MTV headed in breaking in and promoting new artists? TF: There is all this talk that the music industry is down because of downloading and file sharing. I think it's fair to say one of the reasons the music industry is down is because the willingness of labels to take chances and nurture artists isn't what it should be. Bob Dylan had six albums out before he had a hit single. That wouldn't happen today. You'd be dropped after two albums if you don't have a hit single, and that's unfortunate. I see the record industry as mutating, surviving, and actually I see good days ahead for it. It’s going to be easier in many ways for independent labels to get started online and to market and merchandise and promote their artists to consumers. Q: You went from exploring the world to 17 years in the same position at the same company. What makes you want to stay at the same place for so long? TF: I guess I traveled around for a long time because I never really – and this sounds like a real cliché – found myself. I came into this company and all the things I love are here. Just when it's getting boring, there is a new thing that keeps your interest – new services or going international or starting a huge online operation. I just think I'm still in the middle of the things I love. I work with a great team of people. And I get all these free CDs all the time. Mr. Pascarella was interviewed by Michelle Caruso-Cabrera, co-anchor of CNBC’s Morning Call. 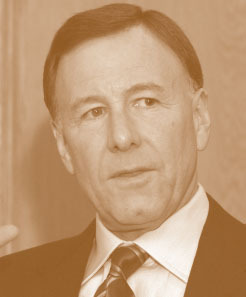 Carl Pascarella has been president and CEO of Visa USA since 1993. 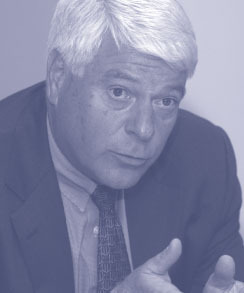 Mr. Pascarella attended the University of Buffalo and received a MS in Management from Stanford University. He worked at Bankers Trust and Crocker National Bank before joining Visa International in 1983, where he served as president of the Asia-Pacific region for a decade before being named CEO of Visa USA. With more than one billion Visa, Visa Electron Interlinked Plus, and Visa cash cards in the market today, Visa cards are the world’s most widely used form of plastic payment. In the past 10 years, Visa USA, owned by 14,000 U.S. financial institutions, and based in San Francisco, has seen its payments volume grow at a 17 percent annual rate, from $277 billion in 1993 to more than one trillion dollars today. MCC: Visa is very different from most financial companies. Can you explain the Visa business model? CP: One of the things that we never ever utter at Visa is the word "association." We drive to a bottom line; we drive to make sure that our customers, whether they’re the banks or the merchants or the consumers, are receiving value. We are a for-profit. We’re responsible for, and are owned by, approximately 14,000 banks, and we’re all about delivering value to everyone who is touching a Visa card, wherever they are. But the banks that govern us are also regulated by us. If you use our brand or you use our systems, you’ve got to abide by the rules that we put in place. I report to a board of directors that is composed of 14 members, representing 10 of the major banks throughout the United States. At the same time, our customers are these same banks, and we regulate them as well. It sometimes is a very, very complex arena to operate in. One of the things that has made us successful is making sure that we understand that the needs of a bank like Chase are much different than the needs of a smaller bank. And that the dynamics a merchant goes through are much different from those of a bank. They’re interested in getting paid, and we’re guaranteeing that payment for them, and making sure that Visa is available 24 hours a day, seven days a week, and that it never, ever fails. For consumers, it’s making sure we’re there any time they want to buy anything, wherever they are, any way they want to buy it. And making sure they have zero liability, so they don’t have to worry about fraud. MCC: How do you divide up the profits? CP: We take a majority of our top-line income and reinvest it. That’s why we’re able to bring new products into the market; that’s why we’re able to look over the horizon and perhaps take a much more strategic look at the payments environment than other companies, like American Express or First Data. Those companies have to return funds to investors, in the form of higher share price or dividends. MCC: Who is your biggest competitor? Is it American Express? MasterCard? CP: At the risk of being immodest, I don’t think so. We’ve moved market share for the last five quarters against all competitors, against all product lines. But since about 1994 or 1995, we’ve really transcended being a credit card company. We’re going after cash and checks. And when you stop and look at the way the pie is divvied up today, we’re 54 percent of the payment systems market. We’re 14 percent of the $12 trillion that American consumers use to pay in cash and checks every year. And that’s the real market. We want to displace cash and checks. Seven or eight years ago, the debit check card arena – debit cards that access your checking account – was about 6 percent of our volume. Today they’re over 41 percent of our total volume. So we’ve made significant inroads to make people aware that you can access your checking account or your savings account through a Visa card, and get that same level of service without having to write checks. MCC: How do you teach a consumer to want something that didn’t exist before? CP: The first thing we did was use the power of the Visa brand. There are two things that are sacrosanct at Visa – our systems and our brand. We had the capability to expand our systems, to be able to offer a debit or a check card product. Then the question was: How to get folks to change behavior? We started with educational advertising, and it was two old men up on a porch in 1993, or ’94. One says, “You know, I use this card to access my checking account.” And we walked through it. We wanted to make sure that everybody understood that this was going to be a universal product, that it was safe and secure. Then there was a lot of collateral material that went out to the branches of the banks, and they did a lot of training at the branch level. MCC: I want to take a step forward. When you talk about the revolution in the electronic payments that you initiated and created, 10 years down the road what does the landscape look like? CP: If you go back 30 or 40 years ago, credit cards were non-existent. Today you can’t rent a car, go into a hotel, or buy an airline ticket without one. So it really is important for us to look at this $12 trillion and how it’s spent today, and how we can change the behavior to help the consumers and the merchants address this. We look at things today like automated payments and recurring payments, we look at quick-service restaurants. Those are the markets that we’re really going after very strongly right now. And in 2003, the growth rates were 100 percent plus in terms of entry into that market. MCC: You’re talking about quick-service restaurants being willing to take the debit cards? CP: Yes, that’s right. And credit cards, for that matter. And people being able to pay their utility bills, their mortgages, their health club and cable bills. It’s a great benefit for the consumer, because they don’t have to sit and write checks all the time. But the important thing from the standpoint of the merchant and the bank is that it makes it a stickier relationship. And today in the financial services industry, the cost of acquisition is so high, that you’ve got to do everything to retain every customer that you have. We introduced a product in 2003 that allows companies – instead of issuing paychecks – to issue Visa cards to their employees and then just automatically update them whenever they’re paid. So many of the people in the United States that work don’t have a banking relationship. These people have to stand in line, pay user’s fees to get their checks cashed, and then have the lack of security of walking around with cash. Now they get a card, the money is put onto their card, it’s safe, secure, and they can use it everywhere Visa is accepted, or they can go to an ATM and get cash, so they’ve got total flexibility. MCC: How about the technology? CP: About two years ago we employed Oracle and Sun Microsystems to put in an IP front end into our legacy systems. And so today, whether it’s a PDA or a cellphone, or whatever the latest technology that Michael Dell wants to put out, you can use that device and access your Visa account and exchange value. But we are totally device-independent, and we are able to route messages and information anywhere the parties want it to go. And that’s a significant breakthrough, because now we’re only limited by our creativity. We keep looking at this tag line all the time, “It’s everywhere you want to be.” We’re about ubiquity. People are more demanding today, they’re smarter, they know much more about technology. MCC: You have a lot of experience in Asia. What are the particular issues that you face in Asia in terms of Visa? CP: The first time I went to China in 1983, the Bank of China picked me up in what they called the red flag car – a black car with a red flag on it. And there was one Chinese hotel where I could stay. None of the Chinese could socialize with you individually. You always had to be in a group. And from the airport to downtown Beijing, we never passed a car. Now today, it’s gridlock. Then, everything was done at the provincial level. We signed an agreement with the Bank of China. Then we found out, well, that’s good for Beijing, but if you want to do any business in Guangzhou, you’d better sign the provincial leader, because he runs the province. There were no telephones from province to province, so we had to put up a satellite to do authorizations. The way we broke into China was to say “We can bring you a lot of foreign income in terms of accepting Visa.” And they got that right off the bat. The Chinese are the most entrepreneurial people in the world, and I think we’re going to see that as soon as the infrastructure is built. But you have to be careful not to get too far ahead of the curve. MCC: How does it feel as a company to have essentially changed the way monetary policy works around the world? I mean, have you thought about that? CP: I have. And you know, I joined Visa for all the wrong reasons. I had been with banks, and I wanted to get a couple of chevrons on my sleeve in the overseas environment, and come back and run a bank. I went over there for Visa, and it was in disarray. We had markets where Diners Card had more market share than we did. When I look back, I have got to be one of the most fortunate individuals in the world, because you are able to change the way people live. With that comes such a huge responsibility, not just personal, but also corporate as well. Because if you misstep, and if you just try to get numbers, and if you get egotistical about this thing, it can blow up in your face at any time. MCC: How about one piece of advice for these folks to close? CP: I think the most important thing is to be passionate, and to really and truly love what you do. And if you don't really want to get up every day and win in the market, or win at what you're doing, or enjoy the people that you're working with, I think you're missing the boat, because life isn't a dress rehearsal. That's very, very important. When I was at Stanford a professor of organizational behavior told a bunch of us, “You folks kill me. You've spent all your time on economics, on statistics, on policy, on accounting. Those of you that are going to end up running businesses, you're going to hire economists and CFOs and IT people and statisticians. But what it's all about is motivating people; it's getting to know people.” That was one of the best pieces of advice that I ever got. Don't lose the human side of business, don't lose the organizational side. Because if you do, you're only going to get so far. Q: I would assume that credit cards are a terrific target for counterfeiters and criminals, given the high value associated with them. What's Visa doing to stay ahead of the curve in security? CP: We've spent hundreds of millions of dollars in terms of what we call “neural networking.” Today, we can recognize aberrant behavior at the point of transaction. So if you have never come to New York or you've never gone to a jewelry store, we'll at least stop that transaction and ask the merchant to do a little bit more checking. And the consumer response to that is very, very positive. We're launching, as we speak, the advanced authorization system, which is going to let banks put further information into the authorization. In terms of hacking, we've got very, very strict rules in terms of who has our data and whether or not it's encrypted. And we always make sure, above anything else, that the fire walls are up and that we’re always ahead of the curve in terms of fraud risk and credit risk. Q: What kind of threat do you see from companies like Pay-Pal, which are doing electronic payments? CP: Pay-Pal and other aggregators are certainly interesting to us. In a lot of cases, the people that load their Pay-Pal account load it with a Visa card, and so that's volume that we get on the front end. With our relationship with Yahoo! and Amazon and all of the leaders in the Net, we certainly are aware of what's going on. Is it essential that we look at the $2 or the 20 cent transaction? It isn't. But what is essential is that the consumer is protected, and that we work with these aggregators to make sure that they are protecting the consumers. Q: You talked a lot about business, but you didn't mention what kind of person you are. What were the personality traits that made you what you are now? Q: Can you talk about how securitization has affected the credit card industry? And how does Visa assist its member banks with securitization efforts? CP: With securitization, you’re selling the risk. And it's done a great deal in order to grow the business. But there are a lot of contingencies that go along with this. The quality of the portfolio has got to be maintained at a certain level. If you have a downturn in your credit quality in your portfolio, you've got to replace those accounts, or you're going to have a capital call. So we help in terms of making sure that a portfolio is up to speed. Q: In terms of emerging markets, how do you balance the decision to go into these markets when you know that risk exists? CP: You make sure that the systems infrastructure is there before you do anything. Because if you can't handle an authorization, and you can't clear and settle the account to get the payment, it's not going to work. And then you've got to work with the regulatory agencies that are there. You might go in with a debit card, or a secured card first. You don't go in and give lines of credit to people that don't understand how to use them. Mr. Weldon was interviewed by Michelle Caruso-Cabrera, co-anchor of CNBC’s Morning Call. William Weldon is chairman and CEO of Johnson & Johnson. Johnson & Johnson, founded in 1886 and based in New Brunswick, N.J., manufactures health care products, pharmaceuticals, and medical devices. J&J, which has annual revenues of $42 billion, comprises more than 200 operating companies that employ more than 100,000 people and sell products in more than 175 countries. 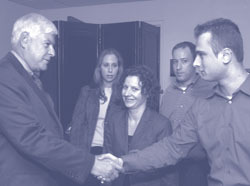 Born in Brooklyn, Bill Weldon graduated from Quinnipiac University, where he serves as a member of the Board of Trustees. He joined J&J as a sales representative in 1972 and, after a 30-year career at the company in the U.S., Asia, and Europe, rose to become the sixth chairman in the company’s history in 2002. MCC: This is a wonderfully timed opportunity. Johnson & Johnson was the lead story all day on CNBC, because it signed a big deal with Guidant. Tell us about the stent wars and about your deal with Guidant today. WW: A stent is a small device that is inserted into the aorta to keep it open. It was a huge medical breakthrough about six or seven years ago, and J&J actually developed the technology. It’s a huge and growing market, because stents really help eliminate a lot of heart attacks. Recently drugs have been put on the stents, which keep the aorta open longer. For about the last nine or 10 months, J&J had the first drug-alluding stent, with a drug named Sirolimus on it. Boston Scientific has another drug-alluding stent, which may get approved shortly. Today the deal we signed was with another maker of stents, Guidant, which has excellent delivery systems. Putting these two top companies together will be an advance for patients. MCC: All day long we’ve talked about how Johnson & Johnson was moving higher. What’s it like to be at work on a day like that? WW: It’s fun. Innovation is what it’s all about. Whether it’s in devices, or drugs, or consumer products. We were the first company that came out with stents, but very quickly other companies came out with better stents, and we lost a lot of the market. Then we came out with the drug-alluding stent, which has really taken the world by storm. And it’s continuing with this acquisition. MCC: Your entire industry has really been under siege. People ask why we can’t get cheaper drugs from Canada. Do you feel drug companies are being treated fairly? WW: I don’t think there is a really good understanding of the drug industry. At J&J, about 50 percent of our volume is in drugs, about 35 percent is in devices, and the rest is in consumer products and diagnostics. I don’t think people appreciate the amount of time and energy and cost that goes into bringing a drug to market. There are literally thousands of products you have to synthesize in the lab to do so, and only one out of every three products that comes to market pays for the investment made in it. You could argue it costs $800 million to a billion dollars to bring a drug to market in 10 years. And the actual time in which you can recoup your investment is shortening every year. I think the investment is really to help patients and to bring these significant breakthroughs into the marketplace. You have to put it into perspective – namely that these drugs are having huge impacts. If you take cholesterol-lowering drugs, and you look forward, you’re going to eliminate a lot of open heart surgery. With stents, you’re going to eliminate open heart surgery, which is tens of thousands of dollars of cost that will be taken out of the system. MCC: What do you do as a CEO to try to deal with that? WW: We try to talk to people and try to explain the investments that are necessary. We work with the government and we work with payers to help them understand. And of course we work with patient groups. If someone is a diabetic, she doesn’t want us to stop spending in research and development on new medicines. MCC: You started as a sales rep at McNeil Pharmaceuticals more than 30 years ago, and now you’re the CEO of Johnson & Johnson. Essentially, you’ve been at the same company for 30 years. Why do you think you got to where you are now? WW: In every opportunity you’re given, you do the best job you possibly can. I think too many people have their sights focused on what’s the next job, and they forget to do the best job where they are. It’s doing a little bit extra, it’s trying to look at new programs, new opportunities and capitalize on them, and to take advantage of everything that’s put before you. MCC: Do you think being at the same company for three decades is a good idea for Stern students? WW: I think it’s a great idea, and obviously I’m biased. To be able to go into a company and build your career within a company is really extraordinary. You build a network, you understand the workings of the organization. 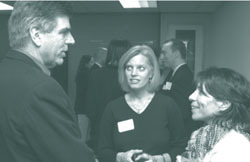 At J&J, there are lots of opportunities to move from company to company. Few companies have such a broad breadth of businesses and such global opportunities. I started as a sales rep, then worked in New York City, then went into the home office and worked through various jobs. I then went overseas, and I spent time in Asia for about four years working for groups of companies. I went to Europe, then came back to the U.S., worked in a device business and ended up back in pharmaceuticals. Then I moved into the office of the chairman. I think I’ve moved 13 times, and I’ve had I don’t know how many jobs. You can do everything within a company like J&J, or a company like General Electric. MCC: In the last 10 years J&J has bought 52 businesses. How do you determine whether or not you’re going to buy a company? WW: We have about 12 criteria. We’re in health care, and we’re going to be in health care. We look at the products the company has; are they compatible with our products? And is it going to take us into areas of new technology, new product opportunities? We ask if it will accelerate our growth, both short and long term. We look at the management and ask if it is compatible with the values embodied in the J&J Credo. We’ve walked away from very good companies, with very good people, where we just didn’t feel the cultures were compatible. You never get all 12 of them, but we go through them and then assess the returns we expect to see over time on a financial basis. We don’t go in with the attitude that we’ll buy a company and throw everybody out on the street. We bought a company called DePuy in 1998 that was a leading orthopedic company. We took our orthopedic company and merged it with DePuy. The reason you want to acquire companies is because they’re great companies. So why would you want to gut them and get rid of them, other than to get cost synergies? MCC: About half your profits come from pharmaceuticals, compared with consumer products and devices. Is the mix going to stay this way? WW: Ten years ago, consumer was the biggest piece and pharmaceuticals were the smallest. Because of the technological advances and the growth of the market, pharmaceuticals have grown to become the biggest part. The pharmaceutical industry is growing at 15 percent and the consumer industry is growing at 3 percent. Right now I think devices are the fastest growing segment of the health care industry, not just at J&J. I think we will probably have a mix that will be somewhat similar to what we have today, as far into the future as you can see. MCC: A lot of companies got rid of their consumer products divisions because they wanted to be pure-play pharmaceuticals or device companies. Johnson & Johnson didn’t. Why not? WW: We see real value in being broadly based. If you look back, there have been periods of time where consumer products are more highly valued and pharmaceuticals are down, and then devices come up. So having a mix of businesses provides some stability. And if you fast forward and look into the future, you’ll see a convergence of skills and technologies. We’ve got a stent called Cypher that really came as a result of an engineer working in our device business and a scientist working in our pharmaceutical business. Even our consumer business is becoming so much more dependent upon science and technology. We’ve moved scientists from our pharmaceutical business into our consumer businesses. We have a company called Aveeno, which is based upon natural ingredients. The scientific work on natural ingredients has been able to expand that business. MCC: There are three CEOs on trial this week in New York City: Martha Stewart, John Rigas and Dennis Kozlowski. Any thoughts on that? WW: It’s unfortunate that a few people try to take advantage of situations and then it gets extrapolated out into the broader industry. I think it’s our responsibility to build the reputation of business executives up again. People who tried to abuse the system should be punished, and I really feel for the people who were secretaries and janitors – people whose whole lives were dependent upon these organizations. I think that we have a moral and ethical responsibility to try to do what's right. I'm not saying J&J's perfect, because as our general counsel says to me all the time: “We've got 112,000 people. It's the size of a city, and there's crime in the city.” At J&J it really does tie back to our Credo and the values embodied in that. MCC: One of the results of the scandals has been the Sarbanes-Oxley law, which creates more regulations and mandates that CEOs sign off on corporate earnings reports. Does it make you nervous? WW: No. We go through half a day with internal auditors and our legal people to make sure that what we're signing is as accurate as it can be. You have to have confidence in the people that work for you. I keep going back to the Credo. It's been around for 60 years. It's an extraordinary document. And we do practice it. J&J holds that the ante to play in the game is the value system that we have. We have to deliver results, but never at the cost of the values. Q: I have a small Internet company called E-Health-Care Solutions. How do you think the Internet is going to impact marketing and advertising going forward? And how many hours a week do you personally spend on the Internet? WW: Consumers are using the Internet to learn things about our products, and I think they need to be informed. We don’t want to usurp the professional's responsibilities but we want consumers to be able to have an intelligent dialogue. My own personal use is very minimal. I have a 26-year-old son, who spends an extraordinary amount of time on the Internet. When I want to find something, I just either ask him or my secretary. But I have to admit, I'm internet illiterate by and large. Q: I'm a first-year student at Stern, and I'm going to be interning in your personal products company. What are some of the main challenges you see in the consumer products business? WW: There's a lot of consolidation. Companies like Wal-Mart are pushing, looking to get the best deals. As every company does, we've got a whole organization down in Bentonville, Arkansas working with Wal-Mart. In 2003, our consumer business had its best year in the past decade. And I think a lot of it has been this movement away from consumer oriented products that don’t differentiate themselves in the marketplace. Neutrogena, one of our companies, is making huge advances in the area of healthy skin and healthy hair. I think Neutrogena is the most highly recommended product by dermatologists, and that's because we have a professional group going to dermatologists who are recommending these products and are creating value in the market place. Q: How do you motivate all of your employees across the different divisions and companies? WW: Motivation is personal. I think it comes down to treating people fairly. And you need to have a sense of urgency. It's not the old management style of beating people over the head. You have to support them. You've got to give them the tools to be able to do their job. You've got to make sure that there is fair recognition. I think the other thing that is critical, and it is embodied in our Credo, is treating people with respect and dignity. I recently asked our public relations people to get together people under the age of 30 who have been with the company for less than five years. I was impressed at their commitment to the Credo and how many people came to J&J because of the values. Our reputation is the most important thing that we have. “I keep going back to the Credo. It’s been around for 60 years. Q: I’m an employee of J&J and a first-year student. In our first class on ethics, I find that a lot of what I add to the discussion is the Credo-based decision-making. I wonder if you can articulate or discuss some examples where you resolved that conflict between fiduciary responsibility to the shareholders and making Credo-based decisions. WW: I think the best example is Tylenol. The Credo of J&J says first and foremost, patients, people use your products. That's who you take care of. Second are the employees and making sure that employees are treated with dignity and respect. Third is the environment we work in. The fourth thing is, if you do those three things, then there's a fair payback to the shareholder. When we had the Tylenol poisonings, we pulled all the Tylenol off the market. We'd never even discussed the financial implications. The Credo actually allowed us to make that decision very clearly, to see that this was in the best interests of the people that consumed our products. Obviously, Tylenol has come back, and it's a huge brand, probably one of the biggest brands out there today.